Now it looks like Ben is working on a 4-digit, 10,000-image system (here and here), and there is talk about developing a 10,000 image system on brainboard.eu. 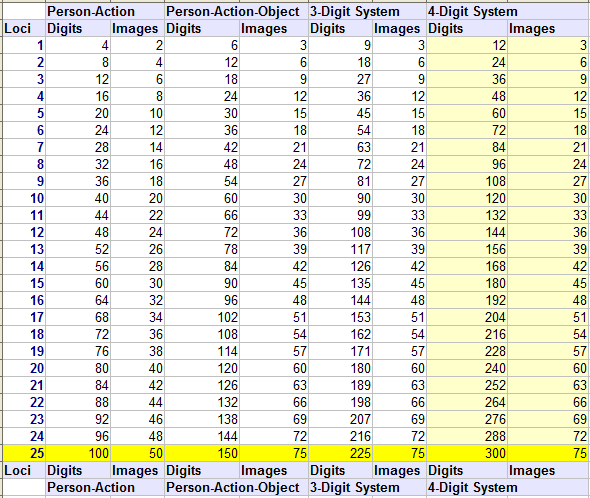 If people manage to make a 10,000 image system work, it could make things much more competitive. I hope they are successful because it would be great to know that it is possible. I think what is sometimes neglected regarding a 4-digit system is that, in all modesty, I have been using one since the South German championship 2010. I have also used it at the WMC 2010 (320 digits in 5 minutes; 1960 digits in 60 minutes, meaning I have already managed to achieve better and more consistent results with it than with my 3-digit system). I don’t know how long it will take others to implement their systems, but mine is working fine and getting better and better. At the moment I am only training with higher amounts at 5 min numbers (500+), and I am getting closer and closer to achieve it. After all, Wang has set a certain standard at the WMC (especially at 5 min numbers) and it will be interesting to try to catch him next year. He seems to be the first true professional of the sport, investing more time into it than others do for their regular job (70+ hours a week during his preparation period of several months). Thanks for stopping by. I’ve always been curious about your system, but have only heard rumors. Do you use completely distinct images for all 10,000 images, or are they compound images where some of the same characters or objects repeat with variations? Have you published the details anywhere? Do you know what system Wang Feng is using? It seems Wang is using a 2-digit-system. Thanks… I’ve been thinking that chunking binaries in 15 might be ideal, but probably difficult to generate images for. Otherwise 10 seems best — 1 line of 30 binary digits neatly fits in one locus. I’m fascinated by the idea of a 10,000 image system, but I’m going to stick with three digits for now, otherwise I will never finish in time for March. 600 digits can be tried with a 3-digit-system, too. A mental athlete I sometimes train with online has some time ago tried 600 and had 586 images right with a score of 480. I have not yet tried 600, but my best try at 500 was 504 of 512 with a score of 432. But I firmly believe and can feel it every time I practice that the 4-digit-system is getting better and better. I think it’s hard work to memorise 10.000 images. How long does it take??? For me memorising 1000 images(000-999) took 3 months. But I work not very hard, about 5-7 hours a week. Wang Feng is using a 5 digit system. It’s all about Chinese. Wang Feng is using a 5-digit system? Do you know how it works? Hi Vector, can you please elaborate on the system. I’ve read his interviews and in them, he used a 2 digit system. Hi just wanted to ask simon how does he encode the numbers? I think the the best way to memorize in four digit sequences is to use the Dominic system for the first two digits, and the major for the next two. It’s really that simple. 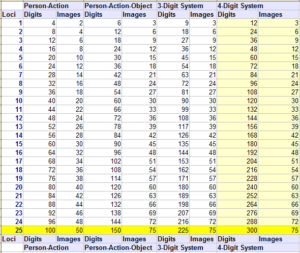 I have memorized images for 1000 digits in the Major system so I can actually turn one 5 digit number into one slightly complex image with person acting on object. That is a 2 digit Dominic acts on a three digit (Major) object, four five digits at a time. Sounds interesting. Have you used it in competition yet? Hi Terry, that’s interesting. I thought of something similar but when you get down to memorizing digits, the time to encode the first 2 in Dominic and the last 3 in Major is longer than just using a PAO system to memorise 6 digits in one location.